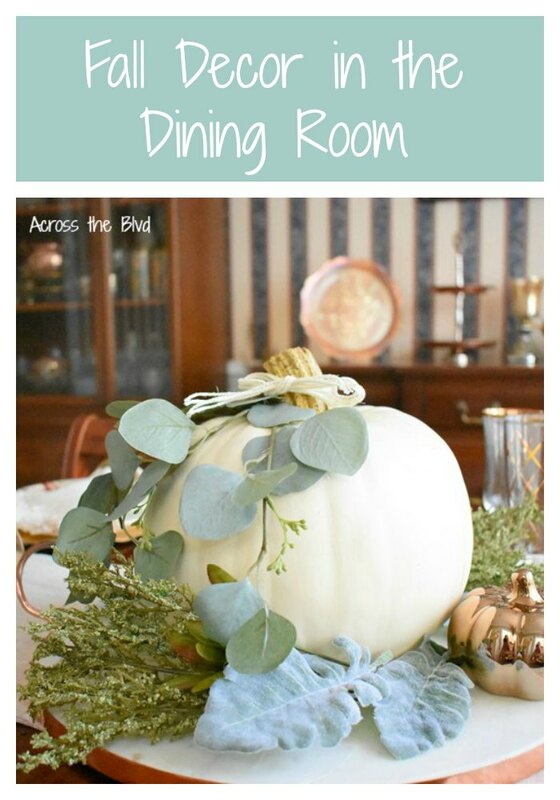 Creating inviting fall decor in the dining room doesn’t need to cost much money. 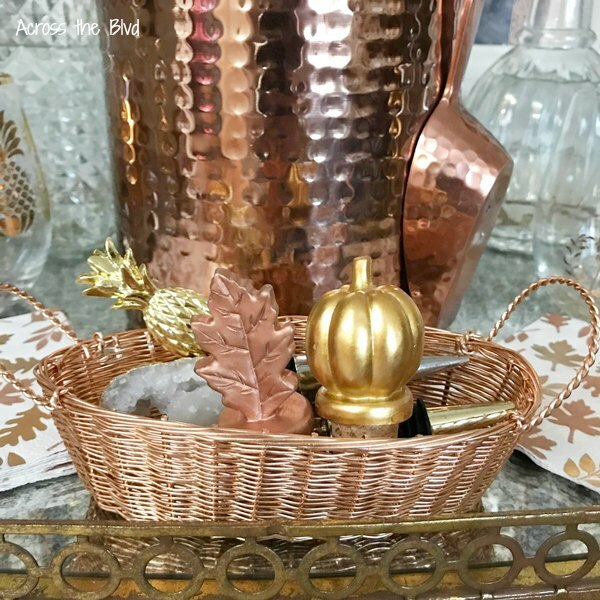 One of the easiest and most budget friendly ways to create a lovely space is to shop your own home for items that work together for a fall look. 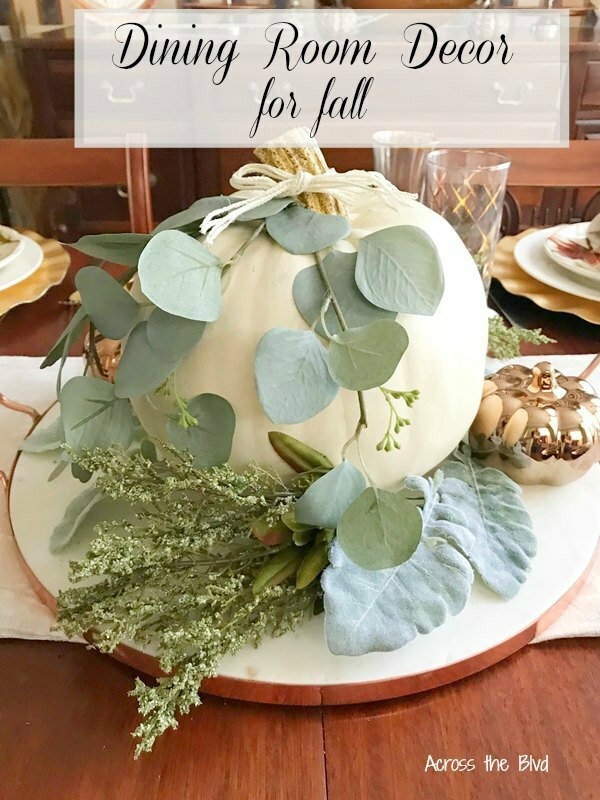 The items I used for our fall dining room came from items I already had on hand. I only made one new purchase and it was very inexpensive. I love the challenge of gathering items together, trying different pieces, and switching things up until I get a look I love. This off-white pumpkin is one that has been used in previous years. 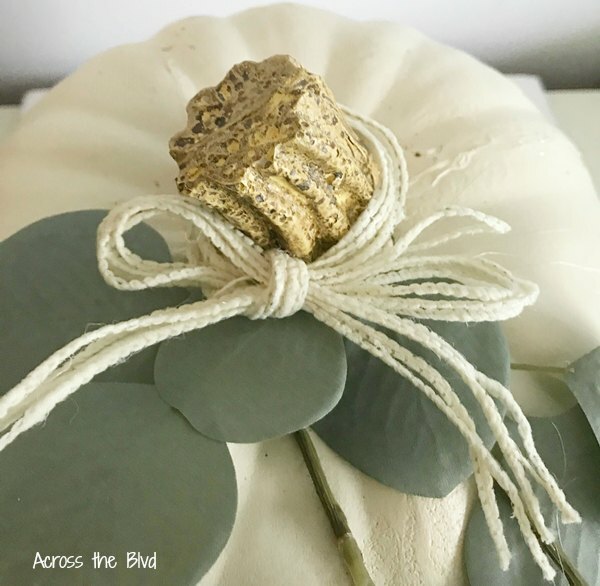 It’s had gold stickers on it, plaid ribbon, and for this season, I changed it to have some greenery a with white twine bow. The leaves are from stems I’ve had in my craft stash. I cut the long stems into four pieces and attached them to the pumpkin with dots of hot glue. 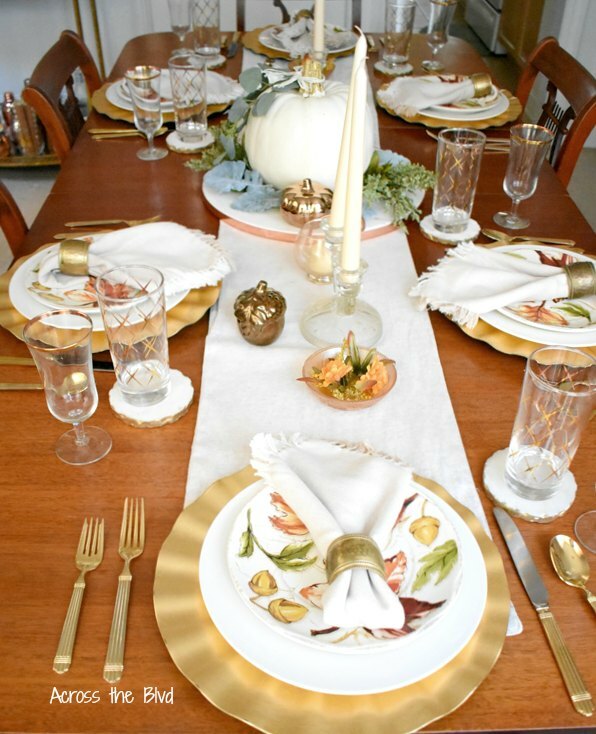 For each place setting, I’ve layered a gold charger, white dinner plate, leaf bread plate and a neutral napkin with a gold napkin ring. I’m using my gold flatware to go along with the gold charger. My vintage gold rimmed wine glasses work well with this look. The dinner glasses were purchased last year at At Home. They were $1.00 each. I’m using the marble and copper tray that was a gift from Gloria as a base for the centerpiece. Two depression era Jeanette Glass in Iris Herringbone candle holders are on either side of the centerpiece. I added a couple of small copper pumpkins to the tray as well as some large leaves and sprigs that are tucked under the pumpkin. 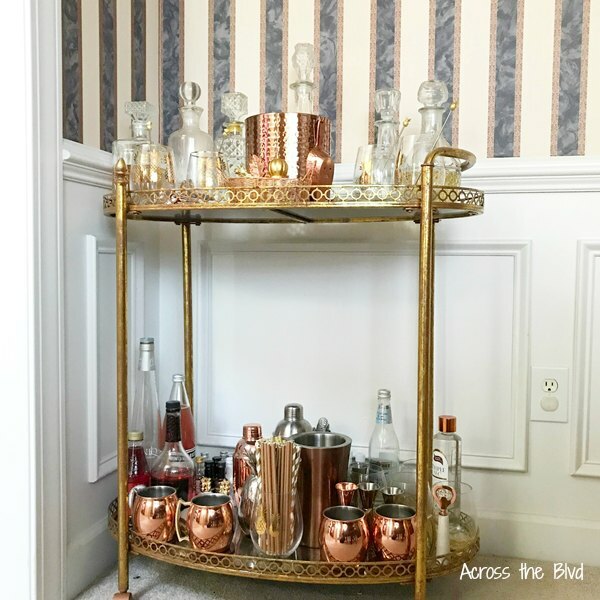 The bar cart that is in the dining room is gold with a mixture of copper accessories. 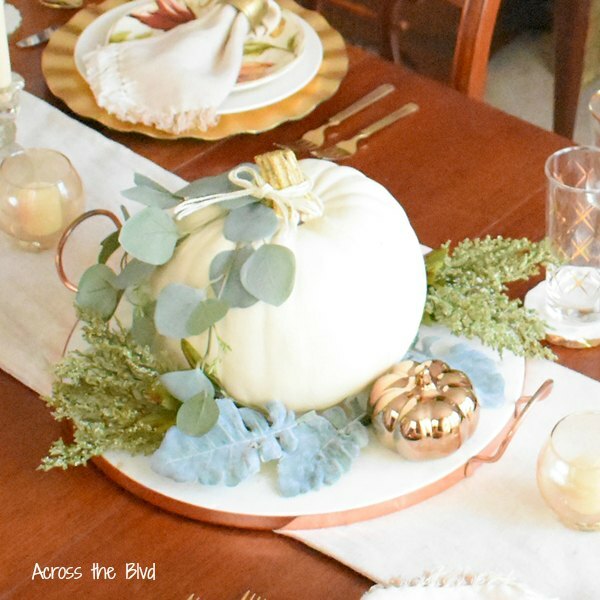 The acorn and pumpkin wine stoppers are the only newly purchased items that I used for the fall dining room decor. I found these recently as a set at the dollar spot at Target. 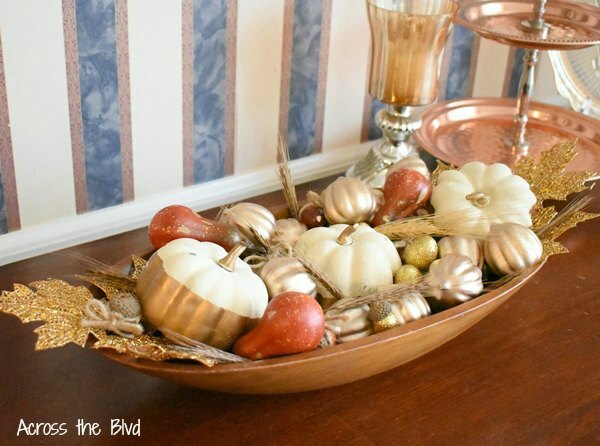 I used this dough bowl last year for our Thanksgiving decor. This year, I filled it with gold leaves, pumpkins, and acorns. A few small gourds are added in to match the copper trays on the buffet. I moved the copper pitcher that was the centerpiece for my late summer tablescape to the top of the china hutch. The bowls and candle holders on the hutch and plates on the buffet are all iridescent Jeanette Glass in Iris Herringbone pattern. I always enjoy bringing out some of my well loved items for seasonal decor. Mixing vintage items with more recent purchases is a look that I love. Your home is so traditional and beautiful. I love timeless elegance. 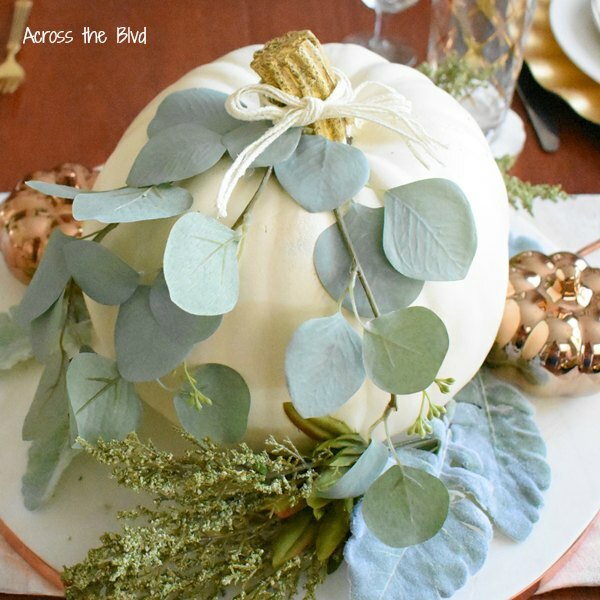 The plain pumpkin centerpiece is all you need as the room itself is just gorgeous. It just makes me imagine pumpkin pie is about to be served. 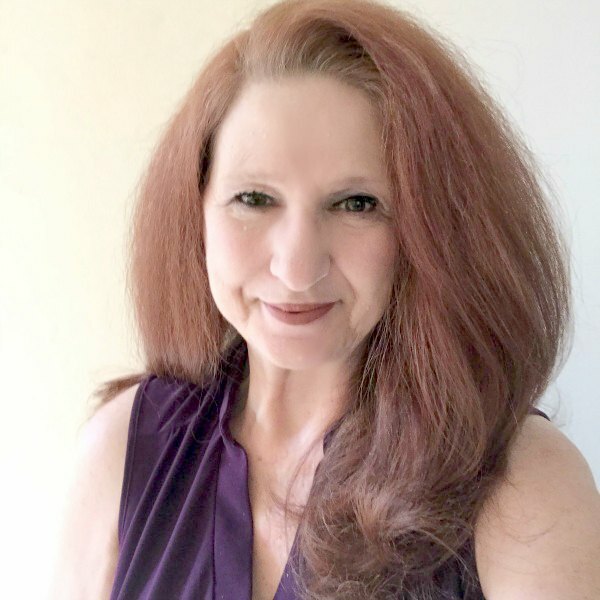 Just lovely, beverly… Would you mind if I featured this on Tuesday Turn about (My weekly round-up). Pinning! Thank you, Julie! I’m delighted that you want to feature this in your round-up! Thanks for pinning, too! Hi, im over fr wall to wall DIY wednesday. This Is sO pretty! Love all the copper decor. Thanks, Juli, I’ve been adding copper accents to my decor for a couple of years and I love it, too. I love the colors you chose! THanks for sharing at TFT. 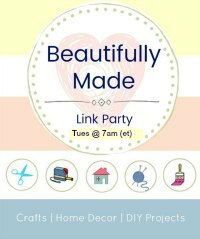 I am featuring you today! Have a great day! 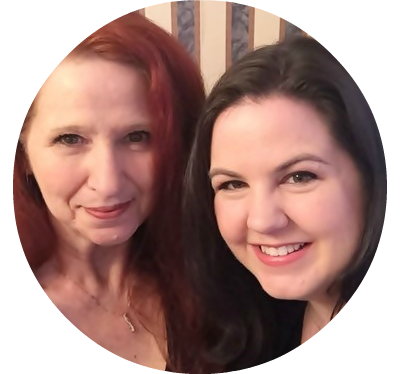 Thank you, Amber and thanks so much for the feature! I appreciate it. Hope you have a lovely weekend. 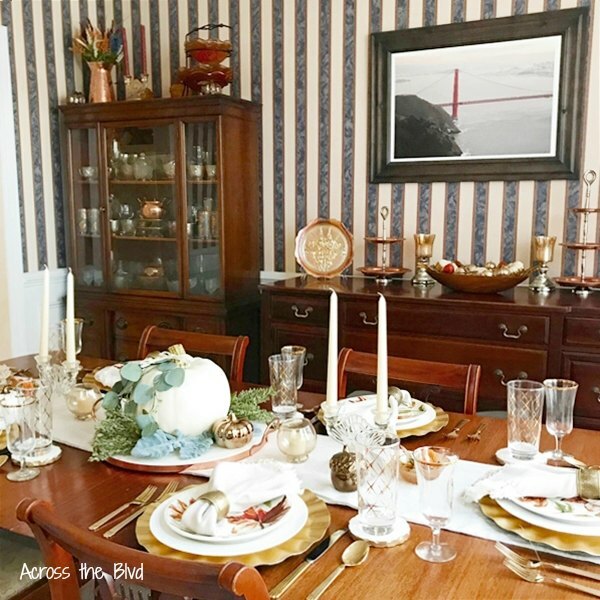 Beautiful dining room ready for Thanksgiving guests. Just beautiful…Thank you for sharing at Party In Your PJs! Thank you, Ann. I’m happy to share at the party. 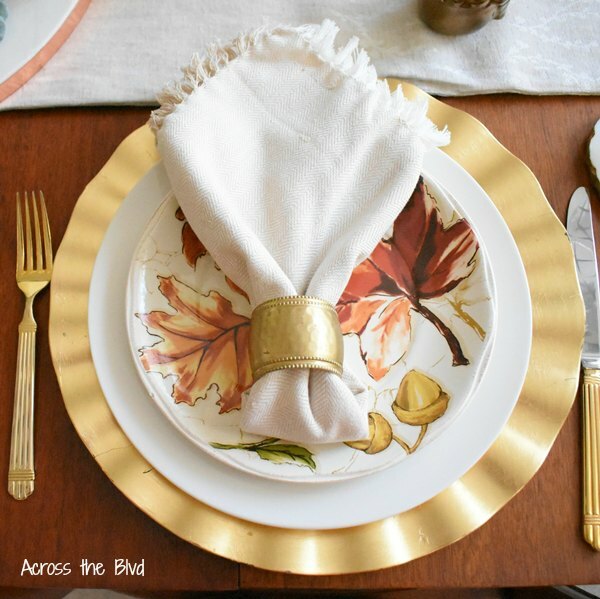 I loved how you tied together items you already had on hand and created such a stunning display for your dining room! Definitely a favorite! Thank you, Kim and thanks so much for featuring it at this week’s Sunday’s Best Party. Hope you have a wonderful week! 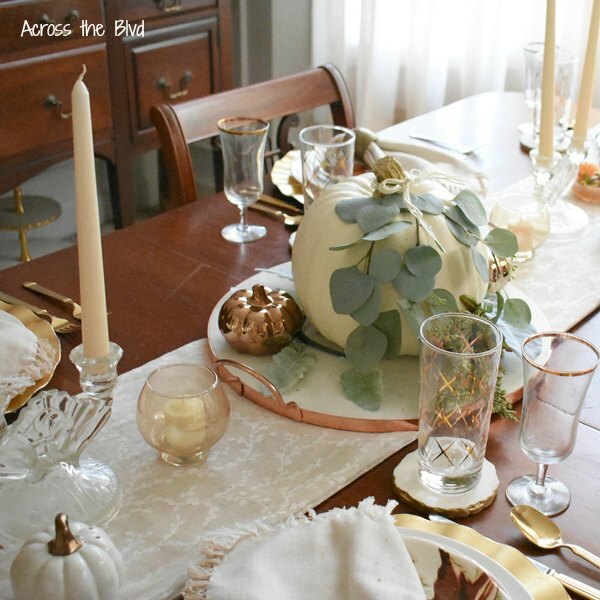 What a beautiful table to gather round with family and friends! Thanks so much, Sandra. We’re enjoying it. Everything looks so nice and I love that big white pumpkin! Thanks, Dee. I enjoyed putting this together.